Abnormality in which the medial digits are lacking, with only the first and fifth represented. See also: lobster-claw deformity, ectrodactyly. an abnormal condition in which the second, third, and fourth digits on a hand are missing and only the first and fifth are present. Also called lobster claw deformity. bidactylous, adj. Abnormality in whichthe medial fingers are lacking, with only the first and fifth represented. SHFM-2 is transmitted as X-chromosomal trait and the locus was identified in a seven generations consanguineous Pakistani family characterized by all four limbs involvement with monodactylor bidactyly of both hands and lobster-claw deformities of both feet 11. 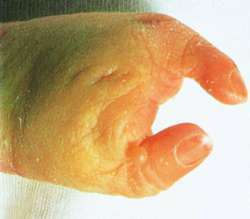 On the right, bidactyly was present, with absence of the middle and ulnar ray and a cleft between the presumed thumb and first digit.